Home > Mother's Day Dinners! > "Classic" Maine Lobster Dinners, Lobster Rolls,Chowders... > Chowders & Bisques > Award Winning Lobster Bisque > Lobster Bisque For Two! Our Award Winning Lobster Bisque is a perfect blend of Maine lobster, sherry, cream and spices. 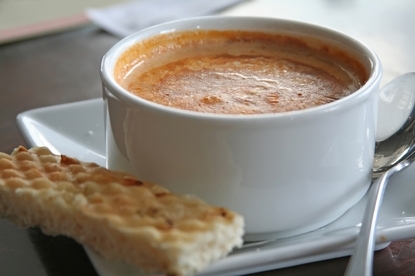 This lobster bisque is one of our most popular sellers! A perfect blend of Maine lobster meat, sherry, cream and spices. This award winning lobster bisque is one of our most popular sellers! Order Our Award Winning Lobster Bisque By 10am EST, And Enjoy It For Dinner Tomorrow! Our Bisque Also Make A Great Gift Idea For Your Favorite Seafood Lover! How Easy Is That! The lobster bisque we purchased was very good. Third time shopping and buying from The Lobster Guy, only way to go. The best by far, love it. Awesome lobster bisque,but we ran out at our party! Sending lots of people your way Tim, they all loved it!